Research has shown that media coverage of Islam is overwhelmingly negative. Often Islam is depicted as a violent religion and Muslim women, wearing head coverings, as oppressed. Even though Islam is the third largest religion in the United States after Christianity and Judaism (and the second largest religion in the world), many Americans do not know a Muslim personally. News, therefore, plays an important role in forming opinions about Muslims. It can be challenging for journalists to sort through the many misconceptions and stereotypes about Islam and provide an accurate portrayal of the 3.45 million Muslims estimated to be living in the U.S. as of 2017. Hannah Allam, who, until a recent round of layoffs, was a national reporter at BuzzFeed News, has reported on the lives of American Muslims for many years. She shared six tips for covering Islam in the U.S. in a phone interview with Journalist’s Resource. 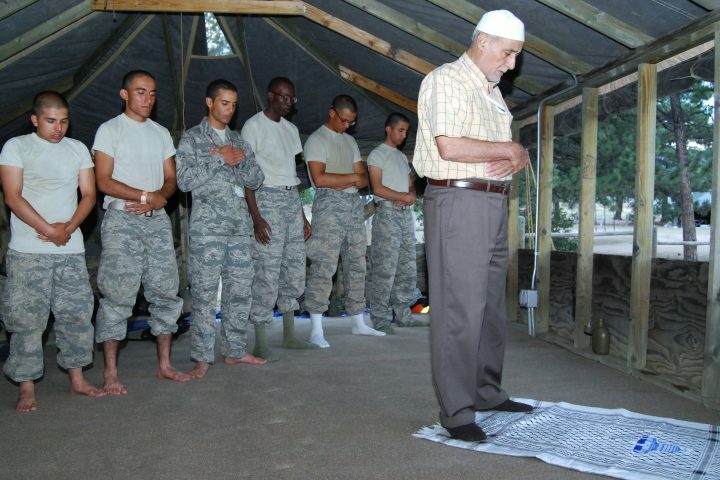 According to a Pew Research Center survey, 4 in 10 American Muslims attend a mosque weekly. About 30 percent of American Muslims go to a mosque only a few times a year, and about 25 percent do not go at all. Allam thus cautions journalists against talking to Muslims in a mosque as the only sources for a story about Islam in America. “When you rely only on the mosque for sources, you are getting views that are typically more conservative and orthodox, and they don’t represent the full spectrum of Islamic practice in the U.S.,” she says. As to where reporters can go, she suggests reaching out to groups such as associations of Muslim doctors and Muslim student associations. If reporters look around, they will also find professional groups such as arts groups and writers groups. When reporting on Islam for English-speaking news outlets, many journalists use Arabic terms or other foreign words such as “Allah,” “hijab” or “Sharia.” “Allah” is Arabic for God, while “hijab” is not just a head covering; it is a broad term to describe modest dress. It could mean many different kinds of covering for modesty — a headscarf, or a veil that partially covers the face; a burqa, which covers the face and body; or a chador, which is a cloak that covers the body. Help the reader understand what it is and be specific about what it is that is being called a hijab, Allam says. She emphasizes that these terms might be fairly well known but are certainly not widely understood. If you’re thinking about using foreign terms, ask if there is a more accessible word, she says. “Sharia” is a broad code of jurisprudence. Often, Sharia is reported as a hard-line interpretation of Islam. Sharia appears in news stories when such interpretations lead to harsh acts such as caning, stoning or beheading. That narrow interpretation, she says, is neither representative of mainstream Islam or of Sharia itself. Sharia encompasses many things such as marriage law (including the right to alimony) and inheritance. It is true that in some Islamic countries, fundamentalist groups use strict interpretations of Sharia to condone violence. But that is not the way in which most Muslims understand or practice, Allam says. In an essay for The Conversation, Asma Afsaruddin, a religion professor at the University of Indiana, explains that Sharia is not a substitute for civil law, but a way for ordinary Muslims to lead a life guided by the ethics of their faith. Allam urges reporters to call up a university and talk to an Islamic scholar to ask whether any given practice is an accurate representation of Sharia. Allam says reporters should also be careful when saying “Sharia law.” It is as redundant as saying “chai tea.” Both words mean the same thing. Similarly, she recommends that reporters ask themselves why they are using an Arabic word for God. It makes sense to use “Allah” within a direct quote, or within a specific reference, such as a Muslim greeting of “Inshallah,” which means “God willing,” she says. But in a more general reference to God, she cautions against using the word “Allah” just because the story refers to Muslims. She urges reporters to ask: If a reporter would not use the word “Dios,” the Spanish word for “God,” when reporting on religion in relation to Latinos, why would they refer to God as “Allah” in stories about Muslims? That makes it appear as though Muslims worship a different God and makes them look like “the other,” Allam says. American Muslims are a highly diverse group. There are many Muslim subcultures, traditions and practices. Among them are African-American Muslims, who account for a fifth of the overall U.S. Muslim population, and encompass a wide diversity of traditions, history and ethnicities. A Pew Research Center report indicates that 51 percent of Muslims whose families have lived in the U.S. for at least three generations are black. African Muslims, in fact, arrived as slaves as early as the 17th century and have been an integral part of the U.S. since its founding. In addition, as with every other religious and ethnic group in the U.S., Muslims, too, bring a long history, along with diversity. Abbas Barzegar, national director of research and advocacy at the Council on American-Islamic Relations, told Journalist’s Resource that in the first wave of immigration, starting in the late 19th to the 20th century, Muslims immigrated to the U.S They included Arab immigrants as well as Turks and Muslims from the Balkan states, followed by Muslims from Yemen and Syria. She explains that it made sense to report on the first Muslim women in Congress because they represented a big milestone. But some stories focusing on Muslim women’s accomplishments can feel “contrived and condescending,” she says, such as features on Muslim women playing basketball or soccer, who are portrayed as newsworthy just because they are wearing headscarves. On the other hand, Allam encourages reporters to include Muslim voices in stories that are not explicitly about Islam. Quote them in stories about topics other than religion, hate crimes or national security, she says. “That will show readers the diversity of their professions — for example, call a Muslim doctor or a Muslim fashion designer and so on,” she says. The Institute for Social Policy and Understanding, a think tank focused on the American Muslim community, noted in a 2018 report that over 11 percent of New York City’s engineers are Muslim. Thus, it makes sense to include Muslim voices in stories about engineering. Similarly, a large number of Muslims work in medical professions. While many resource-constrained newsrooms have a shortage of photographers, it’s important not to rely on stock photos of random women in head coverings. In the interest of avoiding stereotypes, there are many other ways in which Muslims can be represented. “I seldom see pictures like those of my brothers, who served as U.S. Marines,” Allam says. Indeed, Barzegar writes about “the so-called ‘unmosqued’ millennials — a younger generation of Muslims who prefer nonprofits and social startups to mosques and minarets,” who can be found in Silicon Valley and Syrian refugee camps — and also on Snapchat. Reporting Islam Project: Drawing upon international best practices, the website offers journalists basic guidance for better-informed coverage of stories about Islam. Reporting on Islam: This is a helpful backgrounder from the Nieman Foundation for Journalism at Harvard on some common errors and resources for covering Islam. Institute of Social Policy and Understanding: ISPU is a think tank that conducts research that provides more insight into the lives of American Muslims. Pew Research Center: Pew Research Center is a nonpartisan fact tank. Reporters could look for data on its latest polls and what current trends show. The Bridge Initiative: Housed at Georgetown University, the Bridge Initiative is a multi-year project that focuses on conducting research on Islamophobia. SHARIAsource: A research initiative at Harvard Law School, the program provides global information on Islamic law. Islam for Journalists (and Everyone Else), edited by Lawrence Pintak and Stephen Franklin. This book for reporters covers basic facts related to Muslims in the U.S., religious beliefs and cultural differences among Muslims around the world. On Islam: Muslims and the Media, edited by Rosemary Pennington and Hilary E. Kahn. This book attempts to counter stereotypes and misinformation about Muslims through firsthand accounts of people facing the challenges of maintaining their Muslim faith. It also provides a primer on understanding Muslim beliefs and practices. The Islamophobia Industry: How the Right Manufactures Fear of Muslims, written by Nathan Lean. This book explores the spread of Islamophobia in the U.S. and United Kingdom by conservative bloggers, right-wing talk show hosts, evangelical religious leaders and politicians. Kalpana Jain is the religion and ethics editor at The Conversation US, an independent source of news and research-based commentary from the academic community. She worked for many years at India’s leading national daily, The Times of India, and was a Nieman fellow at Harvard in 2009. She has a master’s degree in public administration from Harvard Kennedy School and a master’s degree in theological studies from Harvard Divinity School.